Miami City Ballet rehearsing George Balanchine's Slaughter on Tenth Avenue. All rights reserved. Photo by Daniel Azoulay. 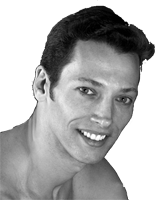 Neal is a Repetiteur for both the George Balanchine Trust and the Jerome Robbins Rights Trust. He has staged the works of these two landmark choreographers for a vast array of companies including Boston Ballet, Joffrey Ballet, Miami City Ballet and Sarasota Ballet. The ballets he has staged include Robbins' Circus Polka, Fancy Free and Balanchine's Donizetti Variations, Episodes, Liebeslieder Walzer, Slaughter on Tenth Avenue, Tchaikovsky Pas de Deux, Valse Fantasie and Who Cares? View videos of rehearsing Liebesleider Walzer & Fancy Free with Richmond Ballet. Philip brings to the studio all he brought to the stage as an artist: elegance, beauty, focus, and thorough attention to detail. Philip's staging of George Balanchine's Slaughter on Tenth Avenue had the right amount of American jazziness. His work in the studio with the dancers brought out the ballet's Broadway feel and the individual attention he paid each separate cast was indicative of a giving and true professional. He brought out the best in each dancer.